This 3 day deluxe camping experience in Chopta takes you deep into the forested valleys of Chopta. Wake up to misty mornings and get closer to the natural beauty of the Himalayas than ever before. With breathtaking views of the snow-clad mountain peaks on every step of the way, you can go on guided tours through the dense forests of oak and pine trees. 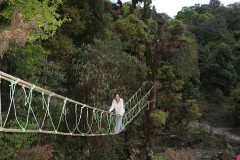 Try your hand at exciting obstacle activities such as rock climbing, rappelling, Burma Bridge, Tarzan Swing and many more. 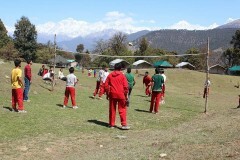 You can also participate in outdoor activities like volleyball, football or cricket. Tucked away in secluded corners of the Himalayas, stay at a campsite surrounded by peace and serenity. After a fun evening spent around a crackling bonfire, you will sleep inside tents under a twinkling night sky. Perched on an altitude of 7,700 ft, the Chopta campsite offers some of the best views of the Chopta Valley and the surrounding mountain hills of the Himalayas. With lush grasslands and dense forests covering mountain slopes all around, the campsite is a perfect getaway to relax and recharge yourself. Wake up to awe-inspiring views of the mountains and spend some time indulging yourself in a session of morning yoga or meditation. Through the day, engage in adventure activities at the campsite or go out for short treks to explore the forests and mountains. At night, you will sleep in deluxe, Swiss tents that are equipped with attached washrooms, comfortable beds and bed sheets to ensure a restful night’s sleep. 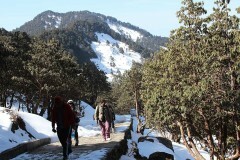 • Spend 2 nights camping near Chopta in comfortable tents. • Spend the night camping under the twinkling Himalayan skies. 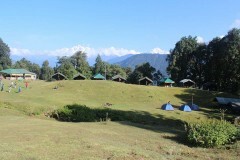 Cancellations made 4 weeks prior to check-in date of 3-Day Deluxe Camping in Chopta: 65% refund. 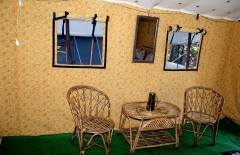 Cancellations made 3 weeks prior to check-in date of 3-Day Deluxe Camping in Chopta: 40% refund. 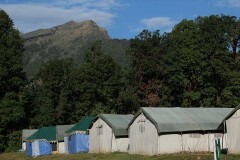 Cancellations made 2 weeks prior to check-in date of 3-Day Deluxe Camping in Chopta: No refund. Check-in time for the campsite is 14:00 hrs and check-out time for the campsite is 10:00 hrs. Accommodation for children under the age of 5 years is not be charged. Accommodation for children between the ages 5 to 12 years will be charged at a discounted rate of INR 1,200 per night. Accommodation for children above the age of 12 years is charged at full price. A minimum of 9 participants is required for participation in adventure activities. Arrive at the campsite in Chopta by 14:00 hrs and check-in to your deluxe tents. You can spend the rest of the day at leisure. Rest at the campsite after a 7-hr drive and take a walk around the campsite to admire the beautiful views of snow-capped mountains in the distance. 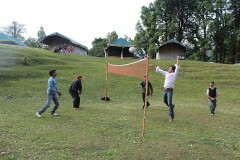 You participate in outdoor games such as volleyball, football, badminton or cricket. If you want to stay indoors, relax and play cards, chess, carom or board games. In the evening, gather around a crackling bonfire and have fun with your fellow travellers. Overnight at Chopta in tents. Campers enjoying a game of volleyball. Wake up early morning and indulge yourself with morning yoga or meditation in the Himalayas. Go on a guided tour of the forests surrounding the campsite and try to spot local wildlife or birds. You can spend the rest of the day at leisure. Engage in obstacle activities such as Burma Bridge, Tarzan Swing, Double Rope Bridge, Cat Walk, Rope Ladder, Commando Crawl, Balance Beam or Monkey Crawl. 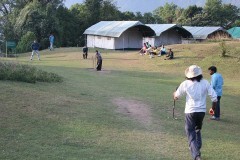 You can also spend the day with indoor and outdoor games at the campsite. In the evening, gather around a crackling bonfire and have fun with your fellow travellers. Overnight at Chopta in tents. Who's winning this cricket match? Wake up in the misty mornings of nature and sip on some hot tea or coffee. After breakfast, check-out by 10:00 hrs. Depending on availability, you can even extend your stay at the campsite. Your trip ends here. You will be accommodated in deluxe Swiss tents on a twin sharing basis. Your tents will come with comfortable beds with clean bed sheet, blankets and soft pillows. You will also have attached washrooms with running water. Today's meal package includes dinner, that will include 1 non-vegetarian dish. You will also be served tea/coffee with snacks in the evening. 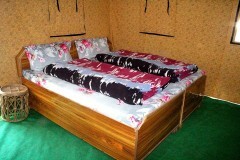 You will be accommodated in deluxe Swiss tents on a twin sharing basis. Your tents will come with comfortable beds with clean bed sheet, blankets and soft pillows. You will also have attached washrooms with running water. Today's meal package includes breakfast, lunch and dinner. You will also be served tea/coffee with snacks in the evening. Sitting area inside the tent. Today's package includes breakfast before check-out at 10:00 hrs. You can take a flight to Dehradun's Jolly Grant Airport and rent private vehicles to travel to the campsite, located 7-hr drive away from the airport.